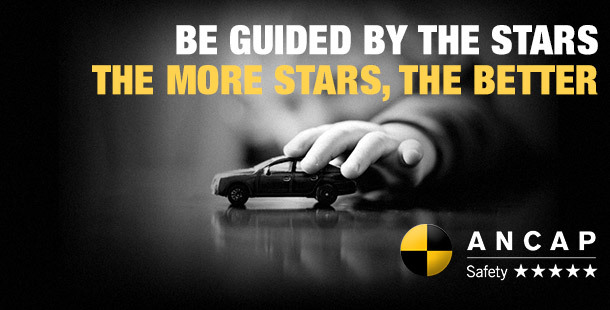 To promote the purchase of cars with very good crash test ratings, the Motor Accident Commission (MAC) and the Department of Transport, Energy and Infrastructure (DTEI) have encouraged motor dealers to display star ratings on all 4 and 5 star rated cars in their showroom and their lots - CMI Toyota are proud to be involved with this program. ANCAP awards a star rating from 1 to 5 for each vehicle following independant crash tests by independant specialist laboratories. New vehicles are awarded or deducted points based on a combination of test categories and scientific criteria. All vehicles are assessed under identical testing standards and conditions. In all tests, dummies are used to measure the various forces on the occupants in a crash. The data gathered is then assessed, using internationally recognised protocols and star-ratings are determined for each crash test. Observations and also made on the displacement of dummies during the crash, as well as structural impact on the vehicle's occupant compartment. Points are also awarded if the vehicle is fitted with safety features such as Anti-lock Braking System (ABS) Electronic Stability Control (ESC) and seat belt reminders. To achieve an ANCAP 5 star rating, a vehicle must achieve the highest international recognised standards in all test categories. Which is the safest vehicle tested by ANCAP? ANCAP does not claim to represent all aspects of vehicle safety. It does, however, represent a major segment of crashes that cause serious injury of death. The test results do not prove which is the safest car in all types and severities of crashes. ANCAP evaluates the likelihood of serious injury for drivers and front seat passengers involved in frontal crashes and side impact crashes. As a guide, consumers should look for vehicles that have earned at least 4 stars. The Toyota Rukus (Build 1) has achieved a four star ANCAP rating while the Toyota Camry Altise, Ateva and Hybrid (2011 model onwards) have achieved the maximum ANCAP rating of 5 stars.